A true barometer of food and beverage trends, the Fi Europe Innovation Awards honour research teams and product developers for their outstanding innovations and invaluable contributions to the industry. Mirroring the market, protein solutions featured high on the winners’ podium this year. The world’s largest food and beverage ingredients show announces the winners of its coveted Innovation Awards for 2017. More hotly contested than ever before, the 2017 Awards were presented at a festive ceremony on 28 November at Messe Frankfurt, Germany. There were ten Fi Europe Innovation Awards categories, plus two Start-up Innovation Challenge categories. A total of 17 companies were shortlisted in the Fi Europe Innovation Awards and a further 10 in the Start-up Innovation Challenge. The Sustainability Champion Award went to pioneering oils producer IOI Loders Croklaan for its sustainable and transparent supply chain strategy for palm oil. The Organic Champion Award was won by herba ingredients, an allergen-free producer of organic rice flour for baby food that is fully traceable, from cultivation to final ingredient. The Future of Nutrition Award (the only category open to non-Fi Europe exhibitors) was presented to Alberts for its Automated Smoothie Machine, Europe’s first fresh smoothie vending machine – now in use at Carrefour outlets in Belgium. The Clean Label & Natural Innovation Award went to Ingredion, who convinced the jury with its clean label-compatible functional rice flour for use in soups, sauces and ready meals. 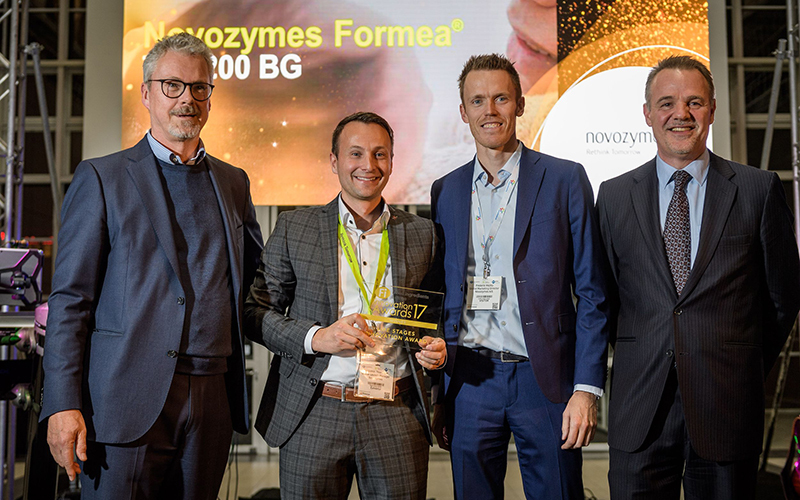 Winner of the Life Stages Innovation Award was Novozymes, a leader in biological solutions, for its Formea® milk proteins – a promising ingredient for infant formulas with a reduced risk of allergic reactions. The Performance Nutrition Innovation Award went to ARLA Food Ingredients for its taste-neutral whey protein isolate for use in protein-enriched sports drinks that are as crystal-clear as water. The Growth Categories Innovation Award was won by ERIE Foods International for its low-fat milk protein crisps. Containing 90 percent protein, these can be consumed as they are or used as an ingredient in bars and breakfast cereals. The Reduction & Reformulation Innovation Award went to DSM for an innovative cheese culture that makes it possible to reduce the fat content of cheese by up to 30 percent and still maintain the texture and mouthfeel of full fat cheese. For the Expo FoodTec Innovation Award there was no winner, but the company Handary received a high commendation for its biodegradable antimycotic protective film that prevents mould growth in solid, packaged food. The Best Innovation Award went to Chromologics, a biotech company spun out from the Technical University of Denmark in July this year. Its first product is ChromoRed, a water-soluble, natural red pigment produced from a proprietary non-GMO fungal strain. The Best Natural Ingredient Award was won by Swiss start-up Alver for Golden ChlorellaTM , a protein-rich, nutrient-dense sustainable micro-algae. Richard Joyce, Fi Europe Brand Director, and Awards Jury chairman Peter Wennstöm of The Healthy Marketing Team led the celebrations and presented the awards.